On the Origins of "EinStein würfelt nicht!" 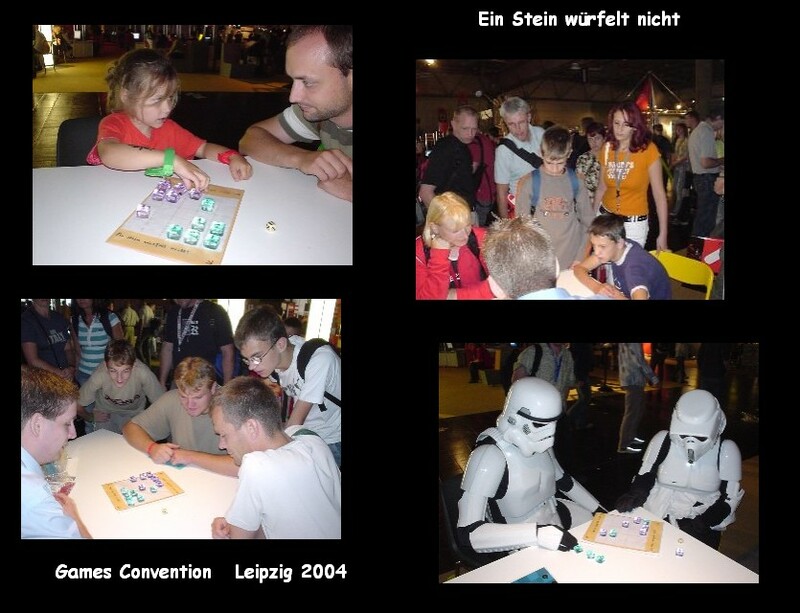 "EinStein würfelt nicht" was designed by me in Summer 2004, and first presented to the public at the computer fair "Games Convention" in Leipzig, August 2004. About three hundred visitors tried it during the four days. Afterwards I was sure that EinStein würfelt nicht! ("Ewn" for short) is a great game. Ewn did not fall down from blue sky. Its predecessor was a soccer board game with random elements. Here are some key steps of its development. 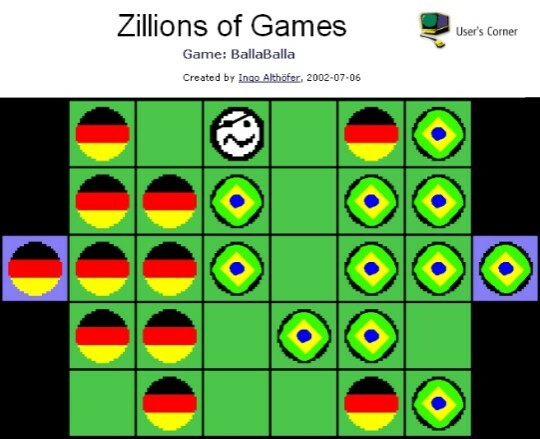 In July 2002, during the Soccer World Championships in Korea and Japan, I had designed the electronic game "BallaBalla" for Zillions of Games. 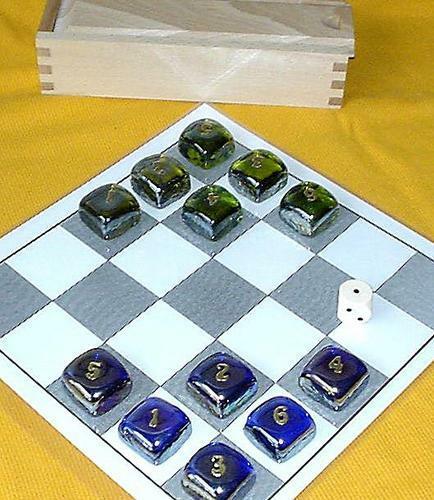 BallaBalla is played on a rectangular board with 6 x 5 squares and two goals. Each of the two teams has eleven pieces - and there are two strange referees. The name BallaBalla shall indicate that the referees act sometimes as if they are crazy. At least they behave rather unpredictably. In this game luck has a very large influence. One year later, I started to design board games which could be played by hand and no longer by mouse clicks only. In this process I had a new look at BallaBalla and modified it: no more referees, the players got numbers from 1 to 6, a 6-sided die controlled part of the action of the players. It was still a game with luck, but also with some strategic depth. Its provisional name: W�rfel-Fussball ("Dice Soccer" in English). 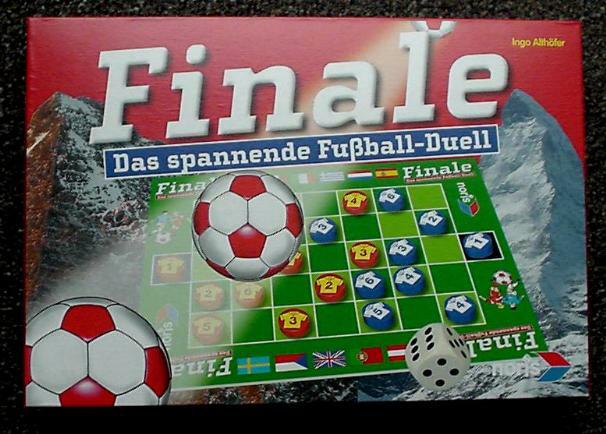 In October 2003, at Essen's games fair, I presented Würfel-Fussball to Ravensburger games company, but they were not interested. Their main argument was a general one: "Sport games do not sell". 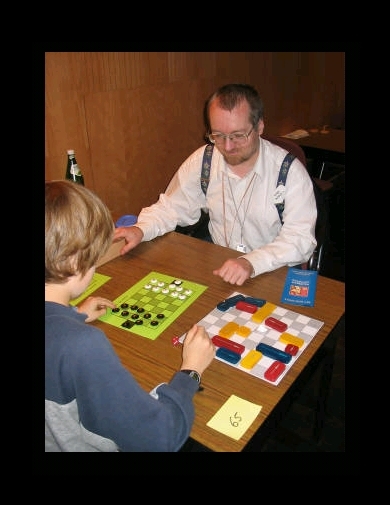 In May 2004, I participated in the world-famous "Games Authors Meeting" (Spiele-Autoren-Treff is its original name) in Göttingen for the first time. In my rucksack I had three prototypes. One of them was Würfel-Fussball. Finale, 2005 Edition. Find my name! Noris chose the name "Finale". Later it turned out that this choice was suboptimal: in 1998 Kosmos company had had a soccer card game (author Oliver Abendroth) with the very same title. In one respect, the long negotiations turned out to be helpful. In the meantime Dr. Jörg Sameith, a former student of mine, had created his computer program McRandom, which helps to improve game design. You simply enter the rules into the program, and McRandom immediately is able to play or selfplay the game rather well. 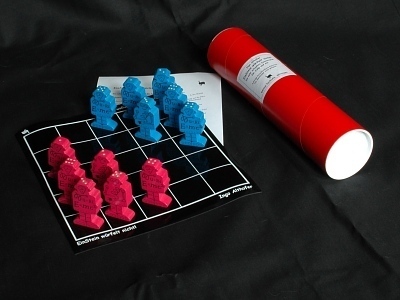 During long test series with McRandom we learned that Würfel-Fussball on a 7x5-board (instead of 6x5) worked much better, because it had almost no more matches ending in stalemate. 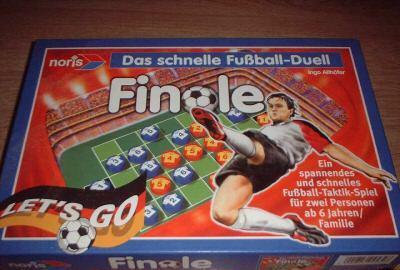 By the way: only from McRandom I understood some strategical elements of Würfel-Fussball. When playing the game against McRandom and using all my brain, I am still stuck at a 40 % score. 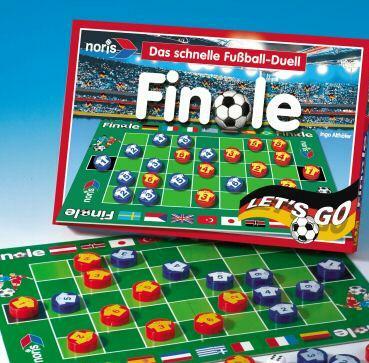 Noris published three editions of Finale, all in different boxes. You can see the ball being shot between the most famous mountain of Switzerland (Matterhorn) and Grossglockner (the highest mountain of Austria). The European Soccer Championships of 2008 took place in Switzerland and Austria. The contract with Noris expired in 2008, and I moved to Kosmos company. Kosmos made a completely new design, also another name. 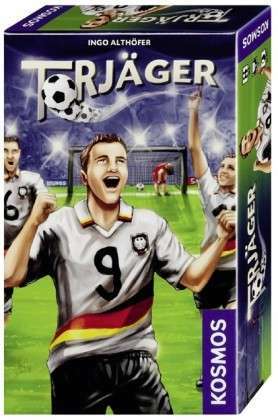 For the World Championships in 2010 they published Würfel-Fussball under the name "Torjäger". 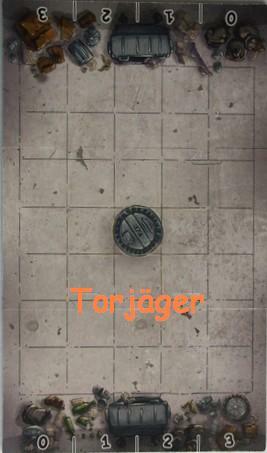 The thing I like most in their edition is the backside of the green playing board: it shows a grey scene from a dirty downtown street, with empty bottles and other garbage, and a drain cover on the central square - almost like a black hole. Until the end of 2018 more than 267,000 copies of Finale and Torjäger had been sold. Some people, also reviewers for games magazines and web sites, thought that Finale was only a "cheap" and less nice spin-off of EinStein würfelt nicht. This website shall help to clarify how and in which order Würfel-Fussball and EinStein were born. Alex Randolph, a grandmaster of game inventing, coined the proverb: "A game is not finished when there is nothing more to add. Instead, it is finished when there is nothing more to delete!" In this spirit, Ewn is nearer to completion than Würfel-Fussball: the board size was reduced from 7*5 + 2 to 5*5, and the number of pieces for each player from eleven to six. Also the capturing mechanism makes Ewn lighter and faster - in Würfel-Fussball there are no captures at all. 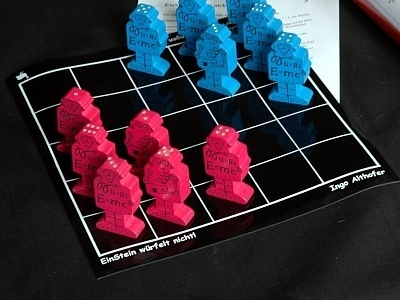 In September 2004, I showed "EinStein würfelt nicht" to Dr. Reinhold Wittig, the always-active guru of the game designer scene and the maker of the touring exhibition "Gott würfelt nicht" (English translation "God does not role dice"). The exhibition was planned to start in 2005. Wittig became enthusiastic about the game, after he and Max Kobbert had played it for half a night - with a glass of wine in one hand and the die in the other. Reinhold Wittig published Ewn in Edition Perlhuhn and made it the accompanying game of the exhibition. With black plane and robots in pink and blue for the pieces. Reinhold Wittig is a very friendly man. He allowed to publish another edition of Ewn in my own little games company 3-Hirn-Verlag.